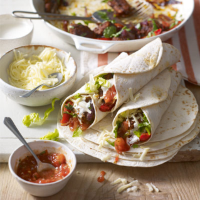 Hot and spicy, these sizzling fajitas are an easy weeknight supper. Serve with refried beans for a more substantial meal. 1. Place the chicken chunks in a bowl with 1 tsp of oil (reserving the rest) and the seasoning mix. Toss well, then cover with clingfilm and chill in the fridge until ready to cook. 2. Heat the remaining oil in a wok or large frying pan and stir fry the pepper and onions for 5 minutes, until softened. Tip into a bowl and return the pan to the heat. 3. Stir fry the chicken gently for 7-8 minutes, until cooked through with no pink meat then return the vegetables to the pan. Cook until sizzling. Stir in the coriander and serve with warmed tortillas, soured cream, Cheddar, lettuce and salsa. Try this with beef: use a 400g pack essential Waitrose British Beef Frying Steak, sliced, instead. For an additional, authentic touch, serve fajitas with fresh guacamole. Find the recipe at waitrose.com/recipes.